This was all made to be this way by extremists and with the help of both Republican and Russian intervention. A similar situation is happening in the UK. Here, leaders in our GOP like Mitch McConnell, who has been a bane upon this country for years now, has deluded half our nation, and angered the other half. And for good reason. They have forced us into separatism and now isolationism from the world, removing us as much as they can, especially Pres. Trump, from our leadership role. As if trying to hand it to Vladimir Putin and Pres. Xi in China. Two other leaders who need to be removed from the world, and their own nation's, stages. McConnell's predecessor, the travesty known as Newt Gingrich, first dragged us into this new age using new media in the early 90s when video cameras were first allowed into Congress and he utilized and abused that format late into the night, kickstarting if not all that we see today in American politics, so very much of the bad of it. This is no longer about the best ideas and people rising to the top. To the point of Republicans now conflating what socialism, democratic socialism are, or what the difference is between that and Nazis Germany. It is now all about the people desired to be at the top by a few, being forced there by illiberal means and through underhanded means, at times bordering on the criminal. It has given us a polarized nation. And that, is never a good thing. Except for those who are doing it and for all those issues used to obscure the truly important issues being back tabled by divisive issues used and abused for merely political purposes. Just as we're seeing today. We have other examples of this being done around the world and throughout history. Brexit is another example in the UK. France just had its tussle and won over the right-wing nationalist. They, were lucky. I am myself part Irish. I have felt Irish since I began high school when in 10th grade I saw a documentary about "The Troubles" going on in Ireland back then. I began to learn more about the Loyalists and the Separatists, the Catholics and the Protestants, the British and the Irish. I was fifteen when my consciousness became raised about The Troubles, in that land of my ancestors so very far away. 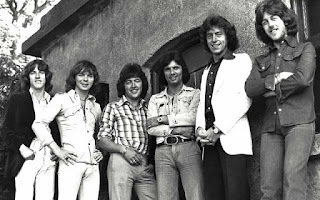 There is a Netflix documentary coming out about the forty-year-old massacre of a band: "Remastered - The Miami Showband Massacre". I had not heard of it until now. I saw and read about, and researched many of the things that happened in Ireland during The Troubles. But this one I missed. I had been paying attention to Ireland throughout the 70s. But the summer of the year this happened in 1975, my younger brother was dying of liver cancer. He didn't make it to his 15th birthday on July 5th. Then not long after the Miami Showband Massacre on July 31st, I was in basic training in the Air Force and had other things on my mind, and no access to media. I kind of lost the world for a bit that year. Learning of all this now just makes that year hang even heavier in my mind. A survivor of that massacre, Stephen Travers, warns that this Brexit issue, could bring up old issues long laid to rest now. Brexit, as I understand it, is an ill-planned, pie in the sky belief pushed along by Russian interventions and mostly a divisive British conservative right wing run amock. Reminds me of the GOP here in the States. It is as much a mess there as we have now in America with our own elections. Could the mess in the UK and Ireland restart, The Troubles? It has much to do with border issues. And feelings that have been long buried. We have ridiculous border issues here in America because a devisive president in Donald Trump and his insane posse the GOP, have blown up a situation into a fake "crisis". Much as had been done with Brexit. Feelings no one wants to see surface again are being called up. While a younger group of Irish citizens do not fear the return of those Troubles. Those, who either no longer remember The Troubles because they were too young to know what was going on back then, or because they weren't even alive at the time. Much of what both countries have been in and are seeing an echo of now, are born from abuse and a lack of care or understanding for those being abused. People trying to be together and yet, are being separated upon ideological lines for reasons having nothing to do with the cohesion of a nation. For me, this all began during a time when I was young. A time in America of the Vietnam War. Of civil unrest in America because of a war no one understood and an awakening of America's youth. Of my orientation in having grown up so close to an Air Force base that I could play outside and watch planes taxi for takeoffs at the end of our road. That had to have had an effect on me. And it did. In junior high, I joined an auxiliary of the USAF, the Civil Air Patrol where we were trained in military forms related to aerospace and search and rescue of small downed aircraft. This after my years in martial arts and fighting in tournaments. It was during a period of my being on a youth pistol and rifle team (I later got my letters in high school being on our school rifle team for three years). Eventually, perhaps it was inevitable, I went into the Air Force. All those things affected me growing up. Much of all that is detailed in my true crime biopic screenplay titled, The Teenage Bodyguard. In the hands now of a major management agency in Hollywood, it details my history and a week I lived in 1974 and a bit of 1975. Hopefully, we can all see all this on screen one day. It is a fascinating story, even if I do say so myself. And I'm not the only one saying so as industry insiders who have read it also liked it very much. Vietnam. I saw my brother's friends come home from that war. Mostly messed up in one way or another. One of my brothers is seven years older than me. None of those people we knew who experienced Vietnam are alive now. Those whom I knew growing up. My brother was lucky. He wasn't taken for the war and is alive today. I was ready to go to the Vietnam war for my country. I was young, foolish, lots of hormones, lots of experience in practicing things and not using them. Raised Catholic, I had reasons to stand for the abused. As head altar boy at our church, I was used to being in charge. Both then and in the CAP where I was a young "Flight Commander" leading others. Eventually, I joined the real military during that war in Vietnam, right at the end of it. Though, I never got to go over there. I was lucky. I spent my military years in peacetime. After a lifetime of confusion and frustration in my home life, in our moving so often up until fifth grade, my parents splitting up in Spain when I was three and we were living there. Growing up bicoastal, in living in Tacoma, WA and visiting our main family back on the east coast in summers. Our mother remarrying when I was five to a man whom I did not like much at all. Our home life growing up was a confused situation between a loving mother and a step-father who had his own emotional problems and who did not much care for me. I'm not complaining here, I'm just trying to explain how an orientation developed and how it can lead to taking sides, to wanting to lash out at perceived, if not real, abuses and abusers. An orientation that even today comes out in my standing against an excessively foolish right-wing GOP. It was in tenth grade at fifteen when I first began to desire to learn about my Irish heritage and really delve into it. And I was horrified by what I discovered. Like about, The Troubles, recently starting up at that time, exposing long-buried scars from the 1916 Easter Uprising and before. In learning of all that, I wanted to go fight for the freedom of Ireland. I grew up loving the Brits, to be sure. I loved their old films. Their history. Winston Churchill still to this day is one of my heroes. More for his intellect than anything else. I loved British humor. Month Python for one and so many others. It was confusing to me how the British I had loved as much, as much as my own America, turned quite suddenly for me into the abusers of the Irish. A country so very close to their homeland. Then I learned about other issues through the history of India, Africa, the Boer War, and colonialism overall. Still, I was ready and willing to go fight for the IRA. I began to learn about the history of the Irish in America, in Ireland and how the British ruled over them. About the Potato Famine and so much more. I took all those confused feelings and the bitterness from my childhood and channeled it into my desire to push the British out of Ireland. But I was only fifteen and I had no money. I had worked at a job since ninth grade. I worked nights all through high school. But I never had money for a plane ticket. I tried to convince my friends to join me. Maybe together a few of us could gather the funds and go fight. But I didn't know any other Irish kids. Or perhaps some I knew didn't know or care that they were Irish. Or what it meant. No one seemed to care what was happening in 1970 in Ireland. Perhaps rightly so, as we were Americans. And everyone thought I was nuts anyway. Maybe I was. In 2015 I finally got to travel Ireland. Walking mostly, also bus, train, and car. I saw Dublin, Galway, Cork, Belfast. I got to share most of the trip with my daughter. From the moment I stepped off the plane until I felt the pain of having to leave at the end. I hope to return. This all affected me to the point that years ago I began and half finished a manuscript of a fiction novel that began in Ireland and ended here in America. It was a kind of horror story involving abuses by a splinter group of the IRA in using four college friends on vacation for their own purposes. I never finished it. Perhaps it's time? If I get my screenplay produced, maybe then I can afford to return. My first ever short story which I wrote during a period of illness over a week when I was fifteen was about a youth abused by those in power for political and imperialistic purposes. There is a thread of this all through my life and many of my writings. How the people are so often abused by those in power. How we are sometimes driven by things we don't even understand and could, if we just stood back for a moment and took a look around us. We are now experiencing it again here in America, openly and I'm stunned it is happening. And Ireland is going through some of it, hopefully not all of it, again also. I am now much older. I see our country here in America being so polarized, so unnecessarily divided. A situation brought on by small minded people for personal greed and power. And a foreign government for purposes of disrupting our nation and western democracy overall. As we're seeing in the UK, in Ireland. Even in Scotland. Where a petty little man in Vladimir Putin and his connections to organized crime has helped to damage so much for his own personal reasons. Perhaps just like our own President Trump. And an extremist right wing and their dying political party aiding them whether knowingly or otherwise. We need to learn from Ireland's past. The UK. Ireland, both south and north, need to learn from their histories. I am not the only one who sees it that way as I mentioned above. One article by Clarin Tierney, British Bullying on Brexit border issue may reignite The Troubles, points this out clearly. My point in all this? History, and what we grew up with, predisposes us to manipulation. By those who love us and those who hate us, as well as those who can use and abuse us. We have to be aware of it. We have to be careful. We have to fight for us, not them. Because they are fighting us, for them. I grew up with an orientation as have others. Ireland has lived what it is like to be a nation divided and a country at odds with itself. We, especially they, both Ireland proper, Northern Ireland, and the UK, need to not return to a period of time when people, their own people, died over issues both political and polarized, used and abused for the purposes of a few over that of the many. We need to see behind these curtains at what is really going on and put a stop to it. Before The Troubles begin anew in Ireland. Before they begin again in America. For we had our own Civil War and it wasn't very civil. It nearly destroyed us. And now we are seeing people pushing us in that direction, not for the good of America or our citizens, but for their own political, monetary and power. This planet, all of us, have been infected by a right-wing agenda, based in a desire for power and control, money and riches. That cannot be what we are about as a human race. Not based in corporate thinking, in political gain, in greed, but in truly humane thinking. Long term planning, not just short term gain. We need to see ourselves, each other, outside of those above us making our decisions. We need to see the forest and the trees. Not just the trees in getting so specific we are lost. We have to see the big and the small and realize, we are the small. It is and can be confusing. But we have to remember we are one, not many separate, but separate together. Yes. It can be counter-intuitive and I know that is something most conservatives struggle with as it goes against their mindset. The mindset of many today in being overwhelmed and wishing for easy answers, quick choices, and binary, black and white reasoning. But that is not life. What is life is, we are all of one nation. Nationism is not the solution. Togetherness is. Small, as one wise man once put it, is beautiful. With one foot before the other, we need to walk together into the future and remember who is in charge. We are. Unless, we allow others to tell us what to do, who to be and to distrust our neighbors. Be they next door, in another county, in the next state to us, or on another coast entirely. We need to draw the line at killing one another. And a line against those who would pit us against one another.